Australia’s 14 million shoppers have shifted their shopping habits over the last decade according to the work of Roy Morgan Research. The key determinants in grocery shopping habits include food safety, location and good value. According to Roy Morgan research more than 12 million shoppers in Australia visited a supermarket at least once in an average seven days. A different survey conducted by AusVeg’s Project Harvest has also revealed the once a week grocery shop is now dead with shoppers going multiple times within each seven day period. Roy Morgan researchers have found that in 2014 55.8 per cent of Australian grocery-buyers nominated ‘High standards of food safety’ as one of the factors that mattered most to them when supermarket-shopping. This was an almost identical proportion as those who said that a location ‘close to home’ influenced their choice of supermarket. 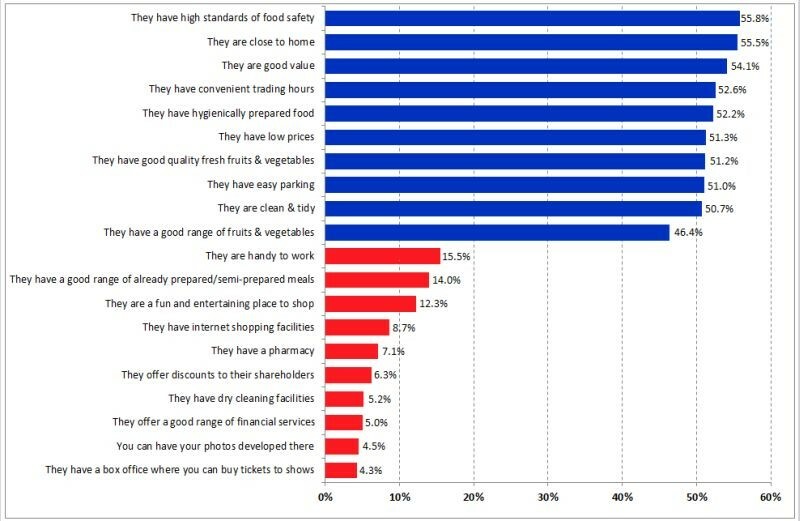 The factors of ‘Good value’ (54.1 per cent), ‘convenient trading hours’ (52.6 per cent) and ‘hygienically prepared food’ (52.2 per cent) also made up the top five attributes that grocery shoppers wanted most from a supermarket. Rating lower on the list of supermarket priorities were add-on features such as ‘a box office where you can buy tickets to shows’ (4.3 per cent), ‘you can have your photos developed there’ (4.5 per cent) and ‘a good range of financial services’ (5.0 per cent). Research from AusVeg’s Project Harvest has however last week revealed the weekly grocery shop to be a thing of the past. The average Australian is now going to the supermarket almost three times a week or approximately 135 times a year. Only one third of Australians are shopping once a week. Whilst many shoppers do a main shop every week, many are using late trading hours to easily grab ‘top ups’ throughout the week. They will also go back down to the shops a number of times to get treats or to go to a specialty food shop. The research found that 80 per cent of Australians are buying vegetables multiple times throughout the week. Most of our shopping is still done in the major supermarkets with consumers preferring the convenience over supporting local and independent outlets. Despite this shoppers generally said that local green-grocers and markets held sentimental value in their hearts and they would choose to go to them if possible. “Nearly 20 per cent of respondents say they buy vegetables at their preferred location because of the people and staff, and another 17 per cent say they visit because of the atmosphere and experience of shopping there,” said AusVeg Assistant Manager – Industry Development, Mr Kurt Hermann. 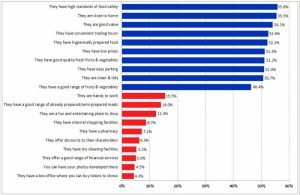 While some of the Top 10 factors that Australian grocery buyers consider most important in a supermarket were similar to those five years ago, Roy Morgan Research found there were some interesting variations between country people and their capital city counterparts. A location close to home was the factor that most capital-city grocery buyers considered important (even ahead of high food safety standards) — but it came in tenth for country-dwellers. Similarly, city folks were more likely than country residents to rate convenient trading hours as very important when choosing a supermarket. On the other hand, ‘good quality fresh fruits and vegetables’ was the second-most important feature for country folk(after food safety standards), but ranked only ninth for city shoppers. The research on country vs. city shoppers has also come out at the same time as Roy Morgan has released statistics showing that Mums are still far more likely to do the groceries than Dads with 62 per cent of women performing the job. If a household has even one child the gender shopping divide is even greater with 91 per cent of females in this situation hitting the shops. It was also found that even in single father households only 85% of them are actually doing grocery shopping. The only case in which men and women are equally as likely to do the chore is when they live alone with no children. Roy Morgan still however discovered that 1 per cent of people in this scenario will not do their own groceries. Here a US expert explains which food trends will be prevalent in 2019.